Georgia continues to be one of the worst tackling major college football teams on the planet. This isn't just a one-game hiccup, this has been going on for several years now. I'm certainly not a football coach, so I don't know if the problem is fundamentals, strength & conditioning or whatever. Nevertheless, this problem is real and needs to be remedied quickly. What's the deal here, and will it ever improve? Why do we fail to wrap guys up and tackle well? I have spent many years wanting Mike Bobo to commit to the running game, only to be frustrated to the point of giving up. Saturday night he commits fully to the running game, but between the tackles with a tailback built to run outside the tackle box. Not to mention against a defense that stacked the interior defensive line to the max. We go super conservative when we had a realistic chance of putting some point margin between us and the Tigers. I know we were concerned about burning up some clock, but our play calling really left a lot to be desired. What am I missing here? 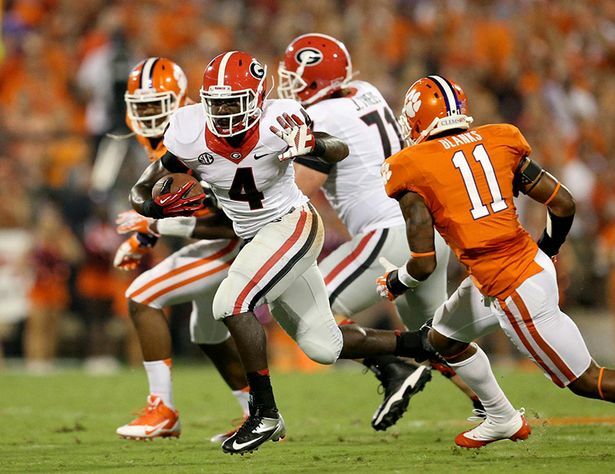 Keith Marshall only needs a crease with his speed, so why not bounce him outside? Then it's third and long and Clemson sends the whole house after Aaron Murray. I'm not saying we are right or wrong in the way we discipline/punish our players. However, if we continue to schedule formidable opponents such as Clemson on opening day with key Dawg players serving suspensions, we will always place ourselves at a distinct disadvantage. We hamper ourselves EVERY single year in this regard. The name I have heard mentioned the most since Saturday night is Josh Harvey-Clemons, a player who never saw the field due to being suspended. I'm not commenting on the validity of the suspension, only on the way it severely handicapped the Georgia defense. Harvey-Clemons would definitely have been a difference maker. I would go so far as to say his presence in the defensive backfield would have been enough to swing victory over to Georgia's side. I realize that is speculative, but what is your opinion? Finally, a fifth year starting quarterback must play like a fifth year starter. Murray did not do that. The loss isn't on him, but he has to know where the play clock is located. And he has to read the thing! Right or wrong?